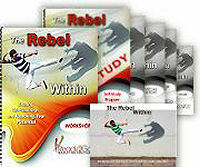 Starter Package: The Rebel Within - Beating Self-Sabotage and Reaching Your Potential from Ready2Go Marketing Solutions, Inc.
Do you have hopes and dreams that are bigger than the life you’re currently living, but when you think about pursuing them, there is something that seems to be blocking your way? And as the dreams get bigger, does the resistance get bigger too? 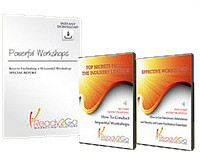 Wouldn’t you like to figure out how to stop that annoying pattern and make your dreams a little easier to accomplish? This resistance is a voice we all have inside us, whether we are aware of it or not. It is our inner critic, our rebel within. It wants to keep us small and safe. It wants us to stay in the status quo where it is familiar and comfortable. If we allow it, our inner critic will crush our ambitions. It will cripple our efforts to improve our life. If we listen to our saboteur, we will never elevate our station. 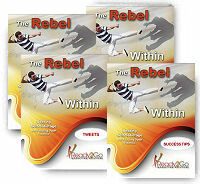 The Rebel Within will strangle the song right out of us, leaving us silent, subservient, and unfulfilled. And what a tragedy that would be. This topic will show your clients how to STOP letting the voices in their head run their dreams into the ground. They will discover NEW concepts that will give them more joy, success and fulfillment at every level of their life. Your clients deserve a life that works for them. They deserve to feel inspired, alive and fearless. And you can help them quiet this limiting voice, and embrace the voice that burns in their heart for more expression and fulfillment.